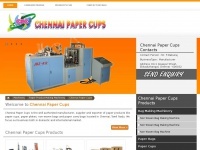 Chennai Paper Cups in Chennai, Tamil Nadu India - Leading Paper Product Making Machinery manufacturer, supplier, exporter of India and also view the company profile, products, contact details of Chennai Paper Cups India on Sulekha B2b. The web server used by Chennaipapercups.in is run by NTT America Enterprise Hosting - Sterling and is located in Englewood, USA. On this web server 13 other websites are hosted. The language of those websites is mostly english. The Chennaipapercups.in websites were developed using the programming language ASP.NET and served by a Microsoft-IIS server. XHTML 1.0 Transitional is used as markup language on the webpages. To analyze the visitors, the websites uses the analysis software Google Analytics. The website prohibits search engines and webcrawlers using the description of the website from the Open Directory project. Other actions by webcrawlers and bots are allowed.